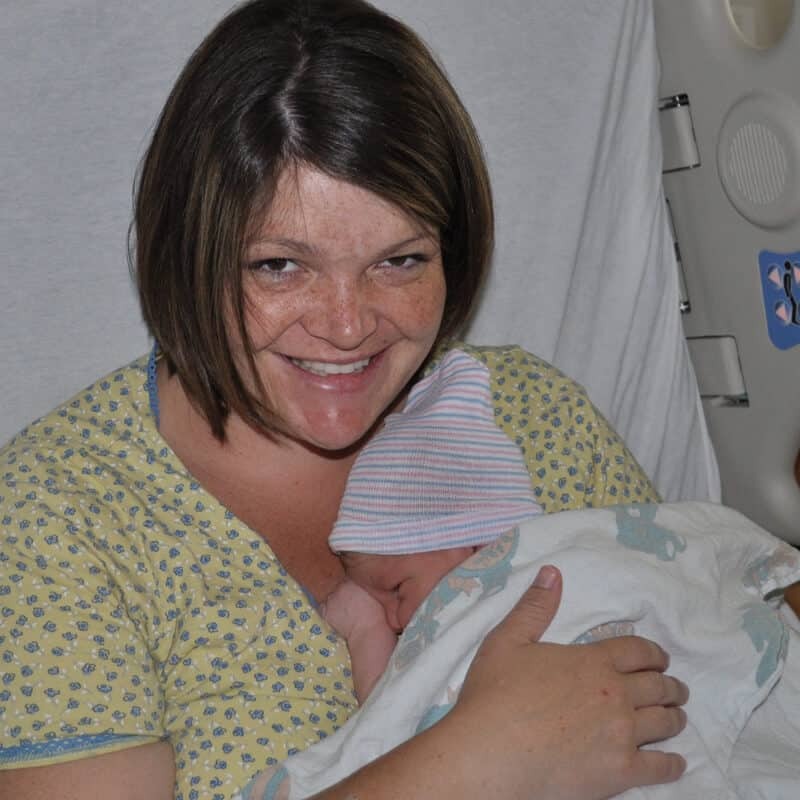 Easy, quick and comfortable birth surprises nurse and mom! To start off with, a brief recap of my past births. My first daughter came on her due date, I arrived at the hospital at noon with some mild contractions coming semi-regularly. Looking back, I obviously went in too early, but my family has a history of lightening quick labors, and my Mom was freaked out I’d have the baby in the car if I didn’t get in there soon. Triage determined I was dilated to a 4, and had a ‘bulging bag of waters’ that was going to break any second. So, I was checked in and immediately a nurse came in and said I needed to get the epidural now. I had planned on getting one, but was surprised they were pushing it now, as my contractions were basically just uncomfortable cramping, and I wasn’t having to ‘do’ anything to get through them. But, the nurse told me if I didn’t get it now, there was no guarantee the anesthesiologist, who had time right now, would have time for me later. Scare tactic worked, and I got the epidural, and they broke my water right after. (I remember being surprised by that, because they hadn’t mentioned they were going to do it, and all I could think of was “I thought it was going to break any second . . . why did you have to do it?”) Despite that though, with the epidural, my labor basically stopped. So, on came the pitocin. Within minutes my baby’s heart rate was freaking out, and they shut off the pit and several nurses were working to turn me and move me into a favorable position to ease the stress to my baby. I had never felt so helpless . . . my baby was in trouble, they were talking emergency c-section, and I felt like a beached whale who couldn’t even roll on to my side on my own. Finally, the baby’s heart rate normalized, and they checked me again, told me I was at an 8, but the baby was really high so I’d ‘be pushing for hours.’ Thirty minutes later, the nurse checked, the baby was coming, and I pushed her out in three contractions. Once things got going, I did end up going really fast, but I hadn’t felt a thing. With my second pregnancy, I wondered a lot about how things would’ve been different if I hadn’t gotten that epidural so early. With further study, I determined that natural labor was the way to go. I was also very terrified of ever needing to use pitocin again, almost to the point of mild PTSD (I’d wake up with nightmares of being frozen in the bed, unable to move while I watched the monitor show ever decreasing heart rates.) I took a Lamaze class (unfortunately, just one offered though the hospital though), and ‘prepared’ for natural childbirth. Two weeks before my due date, my water broke and we headed into the hospital at my doctor’s request. All night I walked the halls trying to bring on contractions, but nothing worked. In the morning, my doctor was ‘no longer comfortable waiting’ and started pitocin. I was terrified of the pitocin. I sat, frozen, in my bed hooked up to all the monitors. A contraction would come, and rather than relax or breathe, I’d end up so tight and stiff that my muscles were starting to hurt. I was terrified of the pitocin causing horrible problems for my baby. Of course, fear is rather unhelpful in these kinds of situations, so I soon agreed to an epidural when I was dilated to a five. (In retrospect, it hadn’t even been ‘painful’ yet, I was just so fearful of the whole situation.) Fortunately things went smoothly, and less than 2 hours later I was pushing out another baby girl. Again, in three contractions, and again, I didn’t feel a thing. My third pregnancy I knew was going to be different. I was going to actually educate myself this time. And not just about birth practices and the politics of birth. I was determined to study and research actual coping methods beyond just breathing. One thing that kept coming to mind was the fact that with both of my labors, I’d gotten to 4 and 5 dilated before receiving the epidural, and I hadn’t ever been in ‘pain’ at that point. Maybe, just maybe, I could cope with labor more than I thought I could. And maybe, just maybe, labor wouldn’t be as bad for me as it looked on TV. Also, with a family history of fast labors, and my last only lasting 2 hours from when they got contractions going, I wasn’t expecting a very long labor. I came across Hypnobabies and decided to give it a try. I started listening to it nightly at around 24 weeks pregnant. First thing I noticed was I was falling asleep, and sleeping better, than I ever have during pregnancy. My husband and I often joked that even if labor was a horribly painful experience, the program had been worth EVERY cent just in good sleep! I practiced my finger drop technique for weeks, but never did do the ‘center’ thing . . . for whatever reason, it just never ‘clicked’ with me. I worried I wasn’t getting enough from the CDs, because I was sleeping through most of them. On rare occasions, I’d listen to the CDs during the day (difficult with a 2 and 4 year old running around), but even then they usually put me right to sleep. I remember the first time I listened all the way through a track that used the ‘release’ cue. I was shocked when I heard the word ‘release’ and my entire body suddenly just melted into the bed! Apparently even fast asleep my mind and body were picking this stuff up! Anyway, moving on to the actual birth. I was five days overdue, and two days away from an induction my midwife was pushing when I started having really, really mild contractions for a few hours around 6PM. They were so mild that my husband (who excitedly insisted on trying to time them) finally gave up timing them when I kept forgetting to mention when they’d start or stop. But they started to fade away after 10PM, as I knew they would, since I felt strongly we’d have the baby the next day ,so we went to bed. When my water broke around 11PM we decided to go straight to the hospital — I put on my headphones for the first time at this point to start focusing on relaxing, since I was nervous about the water breaking bringing on intense contractions. When we got to the hospital I was having the same very minor contractions I’d had earlier. The nurses there had no idea I was contracting, and were pretty surprised when I was almost 6 centimeters dilated. They moved me to my room, where I found out my midwife was out of town, but was excited to meet the other midwife in the practice, who I’d heard a lot about. She told the nurses I didn’t need an IV, so she became my hero (my midwife had pretty much insisted on a hep lock). I’d been more fearful of an IV than almost anything about labor, so this was a huge relief! Except that after a half hour they decided to give me fluids (’cause they were concerned about the baby’s heart rate and lack of amniotic fluid — still ironic to me that I couldn’t drink any water though!). 🙂 So, I ended up with an IV. Oh well. The nurse was actually really sweet and amazing doing the IV, since she knew I had a phobia about them. And it didn’t end up bugging me, because I found that once I was in my room the only thing I wanted to do was curl up on my side and block out everything else and focus on the tracks on my iPod . . . to the point that I made my husband go lay down on the couch and get some rest and just leave me to myself. What amazed me at this point, is that the contractions had started to become more intense . . . but not much. They had my attention, and I couldn’t always relax through them anymore, but I could relax between them. I don’t think they were showing up much on the monitors. I had my husband come rub my back through one, and that felt great. Then I had him do it during the next one, and it was distracting and made the contraction feel more intense, so I had him go lay back down! 🙂 At this point, I was starting to get a little worried about how I would deal when labor really got going. I was still doing great through them, I was barely even changing my breathing or anything for them, but they had my attention. I wouldn’t describe them as painful though. I kept thinking that the contractions were so ‘small’ (I was only feeling any pressure in a fist sized area above my cervix) and they didn’t feel that strong or like they were coming that often, so I was worried I had a long road in front of me. I suddenly felt like I had to go to the bathroom, and had the nurse come in and help me get unhooked from everything so I could go in and pee. I went in and had few more contractions sitting up on the toilet, which convinced me I wanted to get back to bed! Having my headphones off, and sitting, seemed to make the contractions more intense, so I wanted to get back in bed and curl up on my left side again where I was more comfortable. Once I got back too bed I paged the nurse to come in and hook me back up, but suddenly turned to my husband and said, “I think I need to go to the bathroom again.” While in the bathroom I had one contraction that was fairly uncomfortable, and thinking back, I realize there was blood that came with that contraction. I came back into the room, where my nurse and husband were waiting. I didn’t put my headphones back on, as we were talking with the nurse. She mentioned that they felt like maybe I needed to get up and walk around, the get these contractions coming stronger and more often. Seems I wasn’t the only one thinking I had a ways to go. I politely declined though, saying with it being the middle of the night, I’d rather get some rest for a little bit. (It was 1:30AM at this point). I had one contraction while we were talking about the privacy/safety policies of the hospital. I had a second one just a few seconds later, this time I could hear her and follow the conversation, but the contraction had the majority of my attention. Then I had a third one right after. I remember she was talking about making sure I filled out the menu/meal request forms while we were thinking about it. 🙂 This one made me whimper a little, and change positions. She suddenly looked at me and said, “I wasn’t going to check you yet, but maybe I should . . . ” I agreed, and as she came towards me I suddenly cried out, “I think I’m pushing!” Sure enough, she checked and he was crowning. I couldn’t believe it, she hit the nurse call button and was calling for anyone who could come, but there wasn’t even time for her to drop down the bed or anything . . . and for all my stressing about what position to push in, turns out all I could do in that case was just lay back on the bed and push, it happened so fast — he came all the way out the next contraction. Right onto the bed, with the nurse just sitting at the foot of the bed. It was intense there at the end (but really like the last 20 minutes was all I had that felt even uncomfortable, and it was just those few contractions in the bathroom, then those three back to back that turned out to be transition that were intense.) It was over so quick and it had never gotten anywhere near what I thought it would be like. It was suddenly just over and it had actually been painless. And the second he was out, I couldn’t even remember it being uncomfortable. It was just an amazing thing to experience. It was intense for a few minutes, sure, but never really anything I’d describe as painful. But then we were there and it was over with and I was struck by the idea that I could do that again, (I actually turned to my husband within 20-30 seconds of pushing the baby out and said, “Wow, I could do that again! Like, right now!”) And I felt almost silly for having had two epidurals in the past when it was that ‘easy’ for me to give birth! I had to have a few stitches (old episiotomy scar tore a little), but other than that, everything was great. My baby boy was 8 lbs. 1 oz., with a 80th percentile head. He was a full two pounds heavier than my last baby, and a pound and a half bigger than his oldest sister. And yet he just slid out in one contraction. The nurses who all gathered were shocked by our birth. My baby and I were kinda ‘famous’ during our hospital stay — we were the ones who’d had no doctor in the room for delivery. Many of the nurses had wrongly assumed it was a natural birth on accident, but I proudly corrected them that we had planned and prepared for that natural birth, and it had been amazingly easy. It still amazes me that a labor and delivery nurse with more than a decade of experience was chatting with me literally minutes before my baby was in my arms and she had no idea I was nearing the end, and didn’t seem to think I was really even in active labor (remember that ‘get up and get these contractions coming’ suggestion? That was seconds before my last three contractions that apparently were transition.) I’m still curious about how those last several minutes, when I was in the bathroom and then talking to the nurse, would’ve felt different if I’d still been doing my Hypnobabies and listening to the tracks. Those several minutes were the ‘intense’ portions of labor, but they were also almost the only time I didn’t have my headphones on. Who knows, it could’ve been even easier, if that’s possible, if I’d still been focusing on relaxing and my cues! As much as I put into preparing myself for this birth, I never, in a million years, would’ve ever even hoped for such an easy, quick or comfortable birth!